Our selection of classic tours visit areas with the richest roots of skiing history, along with incredibly scenic terrain. They are well planned and distinctively executed in the style we all prefer. August is prime time for steep powder in the Andes. Our 8 day lift and cat served trip will take you to the best skiing in the region. We'll follow the storms while enjoying the legendary South American culture and delicious food. Ski 2 Continents in 1 trip! Journey deep into the rugged landscape of one of earth�s last frontiers while enjoying the convenience, safety and comfort of the Clipper Adventurer expedition ship. 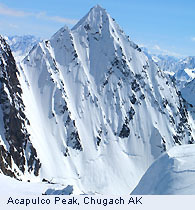 An opportunity to ski some of the famous Chugach peaks and live the classic Alaska experience. Experience the breathtaking scenery and wildlife that draws travelers from around the globe, while skiing daily virtually untracked landscapes that remain the world�s best secret. A chance to ski some of the greatest lift accessible, high mountain glacial terrain on earth. Our 30th year guiding the spectacular and classic Haute Route. Now with upgraded mountain huts along the way. Beneath the flanks of the famous Eiger, M�nch, Jungfrau and the largest glacier of the Alps, we'll tour, climb peaks and ski steep descents among breathtaking views, all based from beautiful alpine huts.